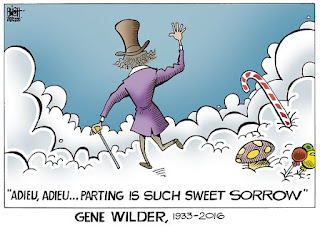 Michael Cavna has a very good piece on the use of the cartoon obituary. 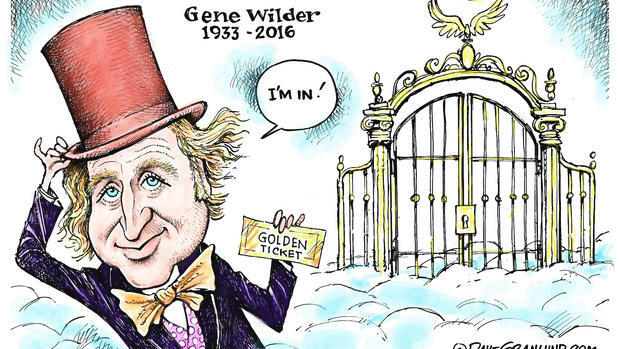 After a celebrity's death, many cartoonists draw up something noting the event. Sometimes they simply draw the person in their own style with an "in memory of" type of inscription, other times they try to do something funny. 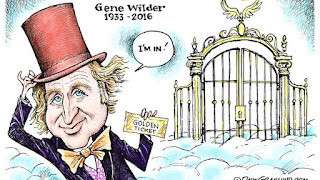 I suppose partially to lighten the somberness of the death itself, and partially because they might hold to the idea that all cartoons should be funny. Or at least all of their cartoons. I’m going to tell you what my religion is. Do unto others as you would have them do unto you. Period. Terminato. Finito. I have no other religion... I don’t believe in God or anything to do with the Jewish religion. 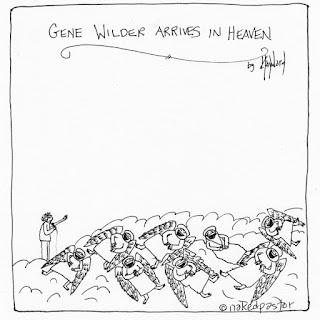 So the notion of Wilder meeting with St. Peter makes no sense twice over! 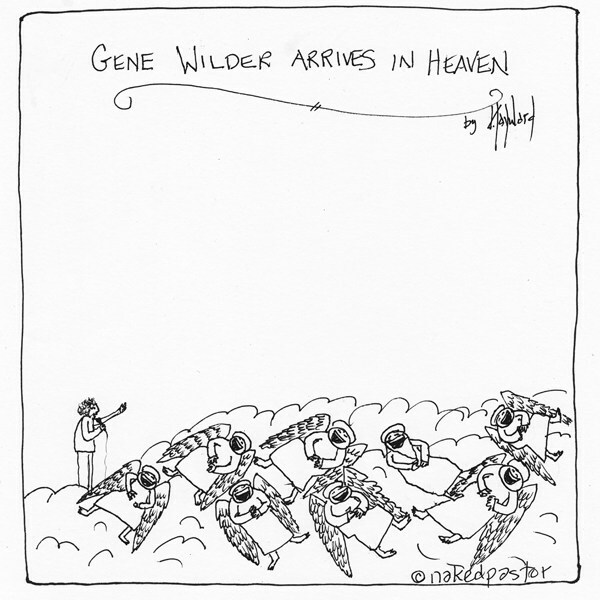 If Wilder didn't believe in God, he would never have pictured himself going to Heaven. But even if you want to assert -- against his stated thoughts on the matter -- that he was never fully atheist and held some portion of Judaism in the back of his mind, Peter was a New Testament figure and not a part of Jewish theology in the first place! What the artist is effectively doing is superimposing their own religious beliefs onto someone else. The person who died was clearly wrong when it came to their religious beliefs, as the Christian interpretation of the afterlife is obviously correct. You see the same thing with all celebrity deaths. 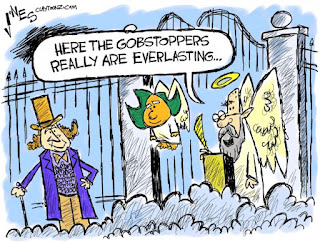 Regardless of what the person actually believed, there are inevitably cartoons of them going to a Christian version of Heaven. Muhammad Ali was a Muslim. George Carlin was an atheist. Steve Jobs was a Buddist. David Bowie was agnostic -- "not quite an atheist." 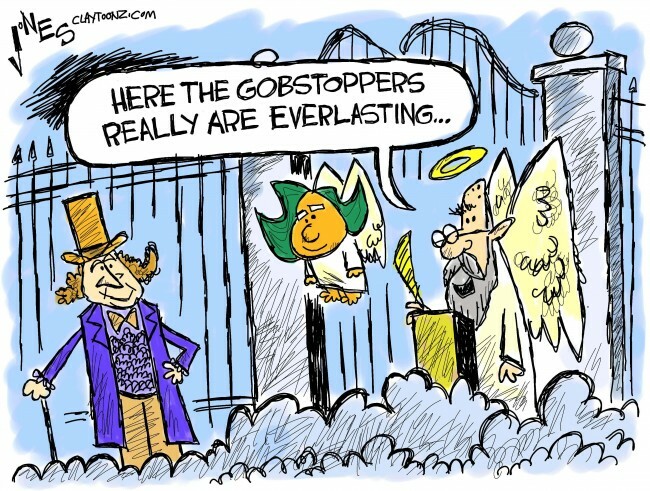 They all had cartoons depicting them going to Heaven. One could argue that the iconography of St. Peter at the gates transcends Christianity and is a well-known enough visual that many non-Christians get the basic idea. 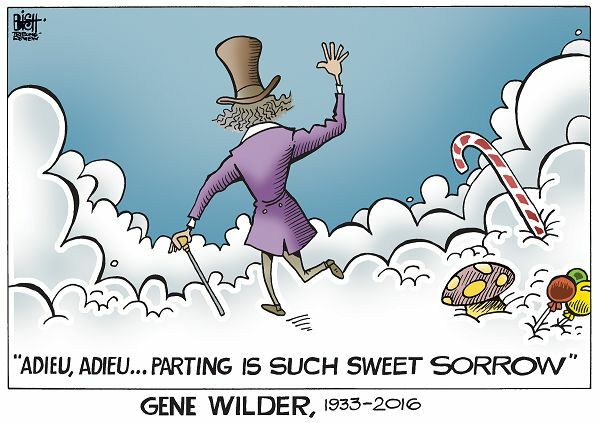 This makes sense from the standpoint of a cartoonist's basic job of using iconography to get ideas across quickly. But it also shows a disrespect for the deceased and, more significantly, for the loved ones of the deceased who know that the person wouldn't want to be associated with a religion they didn't believe in. Flip the situation around for a minute as a thought experiment. If you're a Christian yourself, would you want to be remembered as stepping into Jannah? (We'll set aside the notion that non-Muslims aren't actually allowed in.) The theology says it's a literal paradise, but would you want people to think that was what happened to you after you died? Or what if you were remembered as having Chitragupta tick off your deeds before handing you over to Yama? Or your body was mummified and your spirit was brought before Anubis to be judged? I could keep going, but my point is that you wouldn't want to be remembered as something you're not. 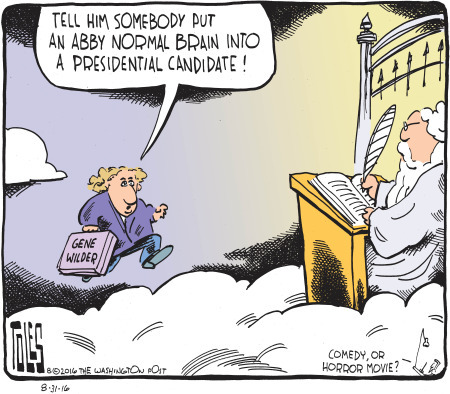 Why wouldn't that apply to anyone who doesn't believe in God, Heaven, and St. Peter at the pearly gates? Why would you think it's okay as an artist to memorialize someone in a way that's flatly at odds with their beliefs? If you're trying to pay your respects to someone, doesn't that necessarily mean you should avoid disrespecting their beliefs? My reflex is that this is an effectively secularized visual convention. Pedantically, I would add that cartoon 3 includes neither St. Peter nor a gate, and that more than one of the others feels more like a satire of the Christian afterlife than an affirmation thereof. That said, you have made a very appropriate, thought provoking argument here. Very well done. And you could argue that #2 is showing a field of marshmallow fluff or the soapy suds from the Wonka Wash. It's certainly the most ambiguous of the the five I pulled together. It's a lot more open to interpretation and, therefore, by my argument, not as offensive.